‘Tis the season! Exactly which season depends on who you ask. For some people, the season of love and joy, peace and hope has begun. This is “the most wonderful time of the year,” and they are never happier since now they can unabashedly wear their collection of Christmas sweaters or ties. According to other people, however, we’ve just entered the season of excess and exhaustion, commercialization and consumerism—that time of year when it’s hard to find the “reason for the season” buried as he is beneath a pile of tinsel and wrapping paper. Within the church we commemorate this season by embarking on a journey we call Advent. Advent offers a gleam of light, symbolized by the Advent candle, during the darkest time of the year, in our hemisphere, at least. But, Advent itself can be puzzling. ‘Advent’ means ‘coming’ or ‘arrival’ and the church toggles between two very different arrivals: the first ‘coming’, that is, the birth of Jesus, and his second ‘coming’ when he will arrive to put all things right and establish his kingdom. 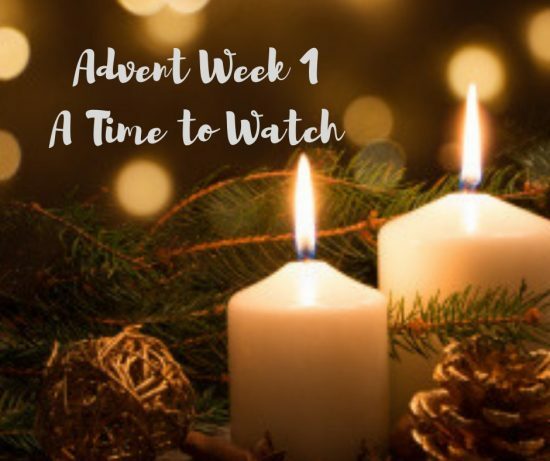 During Advent we look back on the former as we prepare and wait for the latter. It might help us to remember that the early Christians developed what we call the “church year” as a way of telling and reliving the story of Jesus which stands at the heart of our faith. As they did so, they came to understand that it isn’t simply a matter of going ‘round and ‘round the same sequence of events and never getting anywhere. Think of a bicycle wheel; it goes ‘round and ‘round, but it is moving forwards as it does so, not standing still. The same circuit around the hub of the wheel becomes part of the bike’s forward movement. And, that’s the way it is with the church year. We go around the circuit: Advent, Christmas, Epiphany, Lent, Holy Week, Easter, Pentecost, broken up by “ordinary time” and ending, as we did last week with Christ the King Sunday. In moving through these liturgical seasons we are not simply going ‘round and ‘round the same topics and never getting anywhere. We are signing on as part of God’s larger project, God’s forward purposes, God’s plan for the redemption of the whole creation so that, as the prophets said, the earth will be full of the knowledge and glory of the Lord. In the incarnation, God brought heaven and earth together in Jesus; in Christ’s second coming, that joining together will be complete. This is the Advent hope that we celebrate and anticipate in this season. To help us enter this season more fully, over the next four weeks we will look at the Jesus story a little differently. We will examine Christ’s coming and Christ’s return from the standpoint of four “times”: a time to watch, a time to repent, a time to heal and a time to love. The Gospel writer Matthew will be our guide, and we’ll especially be examining how he uses Jesus’ parables to alert us to which time we’re in. Today’s passage, Matthew 24, has been applied to two different kinds of events, neither of which was what Jesus himself had in mind when he spoke these words. On the one hand, a great many readers have heard in these words a warning to Christians to be ready for the second coming of Jesus. On the other hand, some readers have heard a warning to Christians to be ready for their own death. Whatever we think might happen immediately after death, it’s clearly important that we should, at least in principle, be ready for that great step into the unknown, whenever it comes. You can read this passage in either of these ways, or both. But Matthew’s audience would have heard it a very different way. A great national crisis was going to sweep over Jerusalem and its surrounding countryside at a date that was, to them, in the unknown future—though we now know it happened in A.D. 70, at the climax of the war between Rome and Judea. Something was going to happen which would devastate lives, families, and whole communities; something that was a terrible, frightening event and at the same time an event that was to be seen as ‘the coming of the son of man,’ or to put it another way, the ‘royal appearing’ of the Messiah. And the whole passage indicates what kind of appearance this will be. It will be a swift and sudden sequence of events that will end with the destruction of Jerusalem and the temple. Jesus makes three points about this event: first, nobody knows exactly when it will happen, only that it will happen within a generation. Second, life will go on as normal right up to the last minute. (BTW, that’s the point of the parallel with the time of Noah. Until the flood came and swept everything away, ordinary life was carrying on with nothing unusual.) And, third, this event will divide families and communities. The result—and this is the point Jesus wants his disciples to hear—is that his followers must stay awake. They must be alert and keep watch—like expectant parents who know that a baby is coming sooner or later but don’t know exactly when. It is hard for us to grasp the gravity and significance of what Jesus is saying because we read these words already knowing about both the destruction of the temple and Jesus’ death and resurrection. But, try to put yourself in the shoes of his 1st century followers. Just a few verses earlier, Jesus quoted Isaiah who had predicted a time of huge social and political upheaval as one of the signs that would point to the coming of the Son of Man. Jesus is now again predicting a time of huge social and political upheaval as one of the signs that will vindicate him as being the Son of Man. He wants his disciples to pay attention so that they won’t be caught unprepared. The problem is, they are already prone to misreading the signs because of their preconceived assumptions about the kind of king the Jews should be looking for and the kind of kingdom he would inaugurate. The disciples, like all the Jews, expected God’s Messiah to rule as king. They assumed this meant the Messiah would mobilize an army, fight and defeat the Romans and overthrow their rulers, placing himself on the political seat of power and establishing his rule. That was the conventional wisdom. But, of course, that wasn’t what Jesus was proposing at all. The kingdom Jesus was inaugurating was wholly different because he was a wholly different kind of king. The parable of the weeds sums it up well, telling us that God’s sovereign rule over the world isn’t quite the straight-forward thing that people sometimes imagine—or think they want it to be. This parable is all about waiting and watching; and waiting and watching are exactly what we find difficult. The farmer waits for the harvest-time, watching in frustration as the weeds grow alongside the wheat. Not only the farmer, but also the birds wait for the tiny mustard seed to grow into a large shrub. The woman baking bread must wait for the leaven to spread its way through the dough until the whole loaf is mysteriously leavened. And this, Jesus says, is what God’s kingdom is like. Jesus’ followers, of course, didn’t want to wait, any more than we do. If the kingdom was really present where Jesus was, coming to birth in what he was doing, then they wanted the whole thing at once. They weren’t interested in God’s timetable. They had one of their own and expected God to conform to it. Notice, in particular, what the servants say about the weeds. They want to go straight away into the field and root them out. The farmer restrains them, because life is never that simple. In their zeal to rid the field of weeds they are very likely to pull up some wheat as well. Jesus, perhaps, had an eye on the revolutionary groups of his day who were only too ready to step into God’s field and pull up what looked like weeds. There were many groups, including some of the Pharisees, who were eager to fight against the pagans with the one hand and against compromised Jews with the other. These ‘servants’ may have intended to do God’s will. They were longing for God to act and were prepared to help him by acting themselves. But, part of Jesus’ whole campaign is to say that the true kingdom of God doesn’t come like that, because God himself isn’t like that. We have the same struggle today. “Why doesn’t God do something?” we want to know in the face of horrific tragedies and accidents and devastated lives. When tyrants and bullies force their own plans on people and crush the opposition, and seem to get away with it, we wonder why God allows it. We seldom stop to consider what would happen if God ruled the world directly and immediately, so that our every thought and action were weighed and instantly judged according to the scales of God’s absolute holiness. If the price for God stepping in and stopping genocide were that he would also have to rebuke and restrain every other evil impulse, including those we know and even cherish within ourselves, would we be prepared to pay the price? If we ask God to act on special occasions, do we really suppose that he could do that simply when we want him to and then back off again when it didn’t suit us? At the heart of the parable of the weeds is patience—not just the patience of the servants who have to wait and watch, but the patience of God himself. God didn’t and doesn’t enjoy the sight of one of his fields with weeds all over the place. But neither does God relish the thought of declaring harvest-time too soon, which would destroy the good crop along with the weeds, aborting our opportunities to learn, to gain insights, to grow and to mature. The Jews recognized this and spoke of God’s compassion, delaying divine judgment so that more people could enter the kingdom. Jesus, it appears, wanted his followers to live with the tension of believing that his kingdom was indeed arriving in and through his own work, but also that this kingdom would not fully arrive all in one big bang, but rather, through a process like the slow growth of a plant or the steady leavening of a loaf. Perhaps, on this first Sunday of Advent, the invitation for us is to wrestle with what it means for each of us to watch and wait for Christ’s coming, both his first Advent and for his second coming. What does it mean for you to live in this “between time?” How do you wait and prepare for a different sort of king and a different sort of kingdom? Those of us who live after Calvary and Easter know that God did indeed act suddenly and dramatically in human history. When today we long for God to act, to make things right that are terribly wrong, we must remember that we are to wait with patience, not like people in a dark room wondering if anyone will ever come with a lighted candle, but like people in the early morning who know that the sun has risen and are now watching for the full brightness of midday. Thanks be to God. Amen.